Each individual plant cell has the potential to become a whole plant and since plants can not run from danger or travel to search for food, the only mechanism that plants have to interact with their environments is through the production of chemicals. 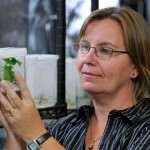 Research programs in the Murch lab develop new technologies for growing plants in sterile, controlled environments to produce clonal propagules, new plant varieties and a steady source of consistent, high quality plant material for studies to understand plant chemical diversity and plant responses to environmental cues. Metabolomics is the detection and quantification of all of the small molecules in a biological sample. The average piece of a plant leaf has contains about 4,000 different chemical compounds. Seeds are even more complex and the average cup of coffee contains about 8,200 different natural chemicals, most are not identified. A glass of Merlot has more than 6,500 distinct compounds. These natural chemicals give flavour to coffee and wine, are useful as medicines, dyes, antibiotics, and various industrial chemicals, are beneficial to human health and make some plants poisonous. Ongoing projects in the Murch lab are discovering new plant chemicals and identifying new ways of producing specific chemical compounds in medicinal plants, food crops, wine grapes and endangered species. More than 50% of Canadians report regular use of Natural Health Products and it has been estimated that 65-80% of the world’s population meet their primary health care needs through traditional plant-based medicines. About ⅓ of the pharmaceuticals we use to treat serious medical conditions originated from plants and there are more than 34,000 medicinal plants worldwide. One of the most common uses of plants is the manipulation of human brain function and human culture is profoundly influenced by those plants which affect the function of our brains. Plant species contain human neurotransmitters, neuroregulators and neurotoxins. Melatonin (N-acetyl-5-methoxytryptamine), hyperforin and beta-methylamino-L-alanine, are examples of compounds found in plants that profoundly affect human brain activity but we are only now beginning to understand the role of these compounds in the growth and development of plant cells. The potential for plant neurochemicals to function as regulatory and signaling molecules has recently opened new directions for research in plant physiology and metabolism. Breadfruit (Artocarpus altilis) has been a staple food and traditional crop in the Pacific for more than 3,000 years and is widely cultivated in the Caribbean and other tropical regions. Pacific islanders evolved sophisticated cultural systems and selected crops to survive frequent famines and these traditional varieties are conserved in a unique germplasm collection at the National Tropical Botanical Garden, Hawaii, USA. In many Pacific islands, breadfruit diversity is declining because of damage from hurricanes, drought, and loss of cultural knowledge. In a collaborative research project involving the Breadfruit Institute and Cultivaris, varieties from the collection are being established in aseptic culture for long-term conservation and as the source of disease-free plant material for worldwide distribution. Flour made from Breadfruit is gluten-free, is high in protein and several vitamins, and is being investigated as a source of highly nutritious food. Further, starch from breadfruit has potential value as a hypoallergenic binding agent and industrial chemical for pharmaceutical manufacture. Finally, individual varieties within the breadfruit collection appear to tolerate highly saline soils and this character is being investigated.